It was a time of deep political upheaval, when enemies were literally at the gates and questions raged within the country about who really belonged and what it meant to be patriotic. Moreover, ideas about what faithful adherence to traditional religion looked like were in deep flux. Charismatic leaders stepped forward, some arguing one way and some arguing another, but all claiming God was on their side, until many people were confused. Sounds relatable, right? Of course it does. I was trying to describe the situation in Jerusalem as the exiles started to return from the Babylonian captivity, and in the Holy Land under Roman occupation. But I’m also describing the feelings of many in the world today. In both situations, deep uncertainty about the future and trepidation about the present drove people to Scripture. The Nehemiah passage describes the reading of the law to the people on the Feast of Trumpets, or Rosh Hashanah. The first thing to notice is that the public proclamation of the law, rather than coming from the top down, was requested by the people: “All the people gathered together into the square before the Water Gate. 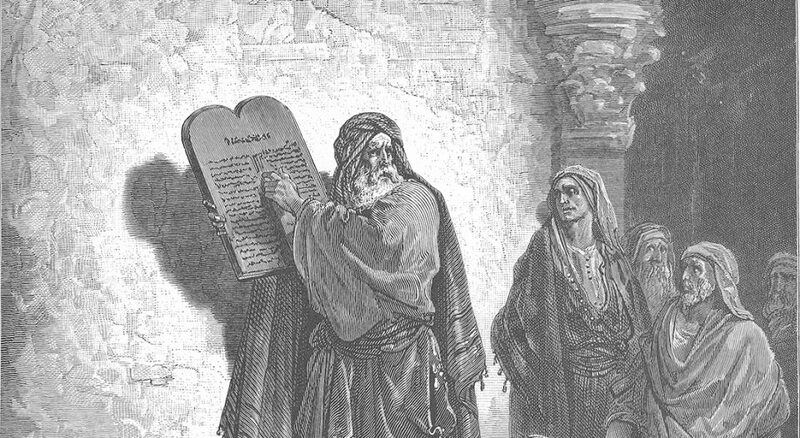 They told the scribe Ezra to bring the Book of the Law of Moses, which the Lord had given to Israel” (Nehemiah 8:1). The author is careful to note that everyone showed up to hear the proclamation of the Law: “the men and the women and those who could understand” (8:3). There was a great desire to hear what God had said to the people and what they had been commanded, such that the people gathered and insisted that their religious leaders teach them God’s word. The teaching that day was especially careful. There are two Hebrew words in verse 8 that provoke a multitude of translations. I think a literal one is most useful here, and I read the verse to be saying something like: “They read from the book of God’s Torah/teaching, breaking it down and putting it so [the people] could understand the readings” (Nehemiah 8:8). Reading Scripture is all well and good, but even Martin Luther, with his love for sola scriptura (Scripture alone), was still a professor and pastor who saw the value in translating and explaining the Bible so common people could understand it. Scripture is a treasure trove of deep wisdom that is worth the time taken to explore and wrestle with it. Certainly, God’s Spirit is always moving and can and does bless even the simplest reading of God’s word. Also, the methodical breaking down of Scripture to understand what it meant to the communities that first received it is a blessing for we who read it today. This careful unpacking of Scripture into understandable sections is exactly what Ezra and his co-readers did. The explanation of Scripture touched the hearts of the people that day, such that many of them wept with sadness at sections (especially in Deuteronomy) describing why their community had been punished for betraying the covenant. The priests were quick to remind them of the importance of celebrating the Feast of Trumpets, however, and urged them to celebrate and to share with those who had nothing (Nehemiah 8:10). The people did exactly that, giving thanks to God and sharing everything they had with the poor, specifically as a response to their new understanding of the Scripture (8:12). Hearing and understanding God’s word led directly to celebration that included justice for the poor. Scripture is a treasure trove of deep wisdom that is worth the time taken to explore and wrestle with it. Several hundred years later, Jesus roamed the Holy Land during another period of instability and unrest. The Persians had gone, but the Romans had come. The needs of the people in occupation were shockingly similar. People were hungry to hear teaching on Scripture, and they flocked to the synagogues to hear Jesus’ message (Luke 4:14-15). Jesus, like Ezra before him, not only read the Scripture but expounded on its meaning. When sitting down to teach, Jesus began his explanation by saying, “Today this scripture has been fulfilled in your hearing” (Luke 4:21). And what Scripture was fulfilled? That Jesus had been sent to offer good news to the poor, freedom for prisoners, healing to the blind and freedom for the oppressed. Whatever else, the preaching of Scripture should always ameliorate the suffering of the poor and oppressed. A pattern emerges from these two passages that we would do well to follow today. In times of national uncertainty, the people turned to hear a message not from civil leaders but from God’s word. God’s chosen leaders then carefully and faithfully broke down the meaning of Scripture for the people, making the word of God accessible to everyone. Finally, the strong connection between understanding God’s word and caring for the poor can’t be denied. If we treasure God’s word and faithfully wrestle with its meanings, we will automatically join Jesus and Ezra in their proclaiming and living out the good news for the poor. So let us read God’s word, seek out teachers who will help us understand, and love and serve the less fortunate.